OBJECTIVE: Participation in mainstream education and employment facilitates both the recovery and the social inclusion of people with psychotic disorders. As part of the second Australian survey of psychosis, we assessed labour force activity and participation in formal education among working age adults with psychotic disorders. METHOD: Data were drawn from a large national community prevalence survey of adults with psychotic disorders. 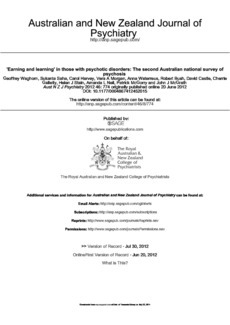 Known as the Survey of High Impact Psychosis (SHIP), it was conducted in seven Australian catchment areas during March to December 2010. Current and past year labour force activity, current employment, past year participation in formal education and vocational training, and key clinical and demographic characteristics were examined in a sample of 1825 participants. RESULTS: Only 22.4% of people with psychotic disorders were found to be employed (either full-time or part-time) in the month prior to the survey. In the previous 12 months, 32.7% were employed at some time. Of those in competitive employment, the majority worked part-time (63.9%), while a quarter worked 38 or more hours per week (23.4%). In terms of educational attainment, 18.4% reported difficulties with reading or writing, while 31.9% completed high school, which represents 12 years of formal education. CONCLUSIONS: The proportion currently employed has remained stable at 22% since the last national survey in 1997. Policy makers and service providers could do more to ensure people with psychotic disorders obtain access to more effective forms of assistance with respect to both their continuing education and employment. More effective vocational and educational interventions for people with psychotic disorders appear to be urgently needed.